Researchers at the Chinese University in Hong Kong found that red onion helps remove bad cholesterol from the body which is responsible for heart attacks and strokes. For their study, the scientists fed crushed-up red onions to hamsters who had all been put on a high-cholesterol diet. Onions have long been known to have many health benefits including preventing cancer, heart disease and common coughs and colds. It has been found that some parts of the world where onion consumption is high have even been shown to have much lower cancer rates. 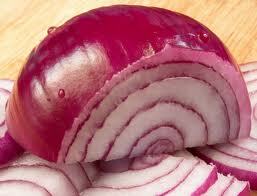 Onions has been used in salad formation in Asian countries since long ago.